The MGTR-II is a small, lightweight, field portable, GPS satellite receiver system specifically designed to perform end-to-end tests of line protection schemes, with Megger SMRT, MPRT and PULSAR relay test systems. The MGTR-II provides a precise programmed output pulse (POP), with 100 nanoseconds of resolution. This output pulse provides a trigger synchronization of two or more SMRT, MPRT or Pulsar test systems to less than ±1 µ Sec of the Universal Time Coordinated (UTC). 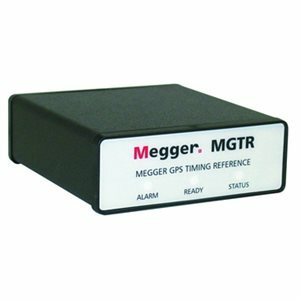 The MGTR-II consists of a twelve-channel GPS timing receiver integrated with proprietary microprocessor-controlled timing and interface logic. The MGTR-II simultaneously tracks all available GPS satellites. The microprocessor-controlled timing and interface logic derives precise timing information. In addition, the MGTR-II provides a standard 1 Pulse Per Second (PPS), and ASCII serial time message, external event time-tag, an IRIG-B serial time code output signal and most importantly, a programmable output pulse for performing end-to-end tests. The unit comes with a 50 foot (15.2 m) long cable and all-weather, high-performance, high noise immunity antenna with an integrated low-noise preamplifier. The antenna comes with a 4 inch tall antenna mount. Control of the MGTR-II is through a standard RS-232 serial connection. Software is provided to communicate to, and control the MGTR-II unit. MGTR Windows® Based Control /Software – Software Version 2.1 is designed for use with MGTR and MGTR-II Megger GPS units. Provides simple user interface to set the Programmable Output Pulse for end-to-end tests. Download the Install zip file to your desktop and unzip to install.